Andman Nicobar release Notification for Police Vacancies, Last date is December 31,2017. 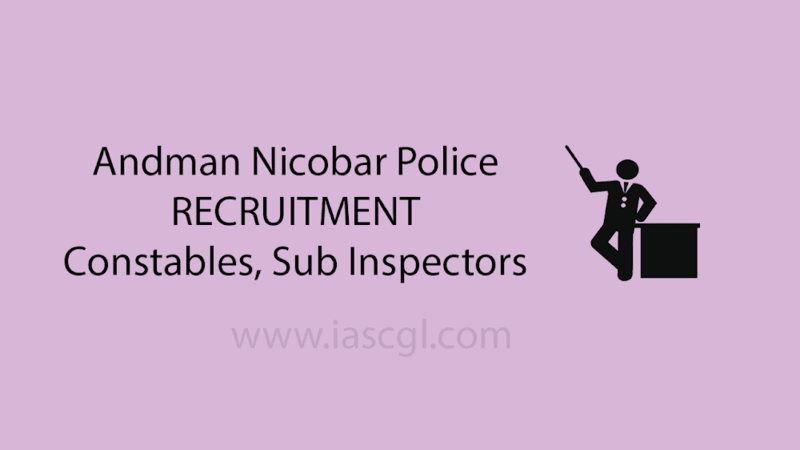 Andaman Nicobar Police Department release notification for 153 Vacancies for the post of Constables, Sub-Inspectors, Pharmacists, Mechanics, etc. You can apply from 1st December 2017 to 31st December 2017. Exam will be held in three phases i.e. Written Test, Physical Endurance Test & Interview. Candidate can check notification and apply from the official website of Andman Nicobar Admin Recruitment at https://erecruitment.andaman.gov.in or from the direct link given below. Sub-Inspector GD & Exe – Graduation in any field from a recognised university. Constables (GD) & Nursing Assistant – Candidate should be 12th Class Pass from a recognised Board/University. Constables (Driver) & Mechanic – Candidate must qualified his/her 10th with ITI. Pharmacist – Candidate should be graduate in Pharmacy or other relevant qualifications. How to Apply for Andman Nicobar Police Recruitment. Click here to Apply for Andman Nicobar Police Recruitment. Click on the direct link given. Choose the post for which you want to apply. Now fill your all details with correct information. Attach the documents as asked in official notification given above. Pay fee, (if any). Take print out of application form for future and save it as PDF too.